"How can I get more subscribers/comments/views?" So the short answer is that honestly, there really are so many ways, from participating in twitter chats to learning everything there is to know about SEO & other technical things that I don't know very much about at all and approximately a million things in between. My question is though, is it that the most important thing? I mean, I know why views and comments are utterly wonderful, as is that feeling you get when someone clicks on the little button that says they like what you're doing so much they'd like to be notified of the things you're going to do in the future but haven't done yet. It's incredible. But is the second person who will click that button in the future more important than the first person that already did? No! What makes something better than something else? Is it the amount of views it gets? Is it the amount of people that talk about it? Does it matter if the talking point is good or bad? Is the amount of comments something receives a reflection of success? And is a something completely unimportant if it gets no comments at all? Is something's 'worthiness' (or 'success', whatever those words actually mean) solely defined by the response it gets? Or is the content itself that brings the 'success'? If you're writing about something that means something to you and no one else sees it, surely even then it can't be deemed a 'failure' because it meant something to YOU. So if you write something that means something to you and one person reads it, is it ultimately more successful or is it just an added bonus to the success that was already there from the original point of creativity? You aren't any less worthy than someone else. You are you. You are wonderful because there is no other you. Always remember that. Welcome to my Monday morning musings. I know right?! Waaayyy too many thoughts, especially for a Monday and especially especially because I'm not sure there are any definite answers..
...and on a lighter note. Squeeeeeee ... coloured lights! My regular fairy lights were making me feel consistently sleepy and although these are very disco, it turns out they're much more conducive to productivity... and/or thoughts that have now spilled over on to this page. P.S. All I know for sure is that I'm unbelievably grateful for you, the very fact that your here at all is nothing short of wonderful. And I truly mean that. What a lovely, positive way to start the week! It is oh so easy to get bogged down with wanting more readers/subscribers/comments/likes, but this post has reminded me to keep a bit of perspective. Thanks Jennie! Many times i have thought about giving up on my little blog because it doesn't seem to grow in followers, i just think about the wonderful people i have met through this slice of the internet. About the random comments of girls thanking for my reviews. And about all the bloggers that do help each other out. I'm not writing my blog for anyone but myself, and anything that comes with it is just a bonus and you, Miss Jennie May, are a huge bonus. You should be so proud of how far you've come. I remember when you were so quiet and shy, and now look at you sharing your life and opinions with the world. You're wonderful, and i'm so glad i met you! Aww, I so agree with your points. I think it's really sad when people are focussed on nothing but the numbers, of followers, or comments or whatever. What happened to the idea of blogging for yourself? As a new blogger, I totally appreciate this post!!!!! And I totally agree - I am writing for me and although I look forward to reaching more people some day, I never want to compromise the content of my blog for that. Thanks so much and have a lovely day!! on the topic: this came on time, cause I don't have a lot of people who follow and 2 days ago I lost one and it's sad, because I'm doing something wrong then. but at the same time I need to be grateful for the people sticking with me and who appreciate what I'm doing. p.s. 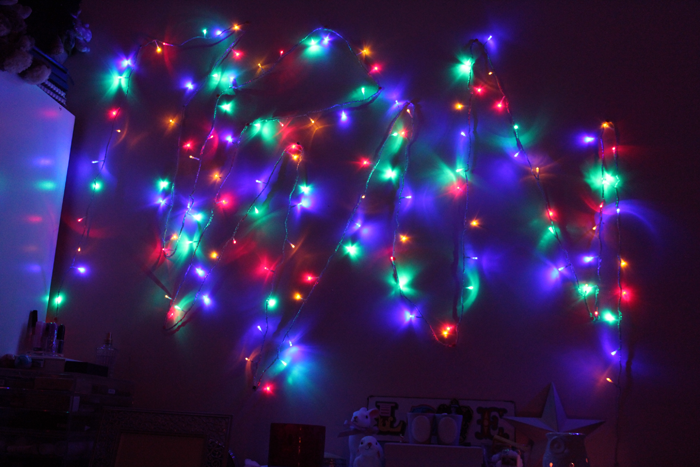 colored lights look so pretty! I used to use colored ones for winter/christmas, but I'm leaving my fairy ones because when I'm home alone I like to leave them lit while sleeping. oh, nothing. it was misplaced from where it's now. but I think it was something about my browser. I'm sorry for mentioning now. I think this post is spot on; it seems such a shame that it's become to some people all about stats and followers when really that takes the whole meaning out of blogging for yourself and ruins it a little. For me it's become lovely in the last few months as I've seen how people support each other & I think that's the best way; to post from your heart and to meet like minded, lovely people! I totally agree - I used to get so hung up on views, and was always trying to make sure each day/week/month was better than the last. Now I try to avoid the staff page of my blog as much as I can, and concentrate on writing! It's still nice to receive comments, and with that in mind I'm trying to comment more on what I read, because if comments make me smile, chances are everyone appreciates them in the same way! I think the same thing about pageviews, I tend not to monitor them so much as my I used to get excited and my boyfriend pointed out some views were coming from spam bot type things. This was a little bit of a letdown haha. Also, seriously what is it with white lights making you sleepy? They do the same thing to me! lovely post and i completely agree. i recently started over with my blog because i didn't feel everything i was posting i was in love with and yes, my views/comments/followers are majorly down but its made me so much happier looking at my blog because i love everything on it! and at the end of the day my blog is for me! i also really feel the sense of community has been lost in blogging and people don't comment on anything anymore so just tend to not worry about it so much now! This is so timely. I am in awe. This made so much sense. <3 Thank you for writing this. This alone is a success considering it was able to make people ponder on what really matters. love the bright lights! so festive & fun! also I agree with everything you wrote! I recently switched blogs to get a fresh start and decided I'd rather focus on getting to know bloggers and investing in the blogs I really like as opposed to trying to get a ton of comments or followers. Yep that's many thoughts for a monday ;) but they're really good thoughts! And I really like the colorful lights! I have had the same thoughts this past week, after seeing what seems like everyone tweeting all over asking for followers, just for the numbers, I am thinking what is it for? I follow blogs because I love reading what the person has written, or I just like their photos. I comment because I haves something to say, because I want to respond to what she/he has posted as if they where talking to me. I love just talking, not looking at the numbers and not fretting if they go up or down, but just Talking. I love your lights, I am thinking about leaving all my fairy lights up, the kids love them so much anyway! Hear, hear! Sometimes I'd prefer not to know how many views a post received. My favourite posts never seem to be the most popular but they make me happy so that's all that counts really. ;) One of my favourite blogs has less than 50 followers but it's fantastic. It really is all about content and passion. I relate to that so much. A lot of times the post I enjoyed writing the most are the ones that get less views and comments, lol. And my boyfriend points it out like "I guess people don't like that stuff too much" but I'm like "but I do. I write blog posts for myself, it's MY blog." This is so true and I'm pleased you made a post about this. I often think it's a shame that in the blog world success seems to be determined by stats and the amount of followers etc. I think we need to think about success in different ways. Enjoyment is most important in blogging. I also think writing about what's important to you and making friends are indicators of success. The best blogs, in my opinion, are certainly not those with the most followers. Agree with all u have said. blog is yet another outlet to feeling about anything. let us let it thatway. What a wonderful post. I think you've made a lot of people feel more certain and clear about why they write what they write. It's easy to feel bogged down by this online world and how many comments/twitter followers/bloglovin' followers you have but you've hit the nail on the head and you're quite right, more often than not the wonderful content doesn't have a billion likes and comments but that doesn't mean it's not brilliant! I think that to have the initiative and courage to put your thoughts and opinions online is worthy enough of a pat-on-the-back in itself! This post is utterly brilliant, and I wish every person who regularly produces content could take a couple of minutes to read and enjoy this post as much as I did. Also - I better add, thank you for all of the lovely comments you leave me. I may not get many in general but it is the few lovely ones that make it feel a bit more worthwhile - and that's what counts. Thank you. Since I've become more involved in the blogging community I've been a little overwhelmed with the amount of follower begging, or multiple tweets and posts about "mile stones" people have hit. I find it so strange. Maybe it's because blogging is my hobby and not something I'm trying to turn into a career. Of course I'm over the moon when people read my ramblings, but I'm not desperately counting who follows along. Your fairy lights are very cute and I totally agree with you I think blogging should be more for happiness than success.